On this site, you can send your views to the E-mail address given on the "contact me" page, and your views will be placed on the Letters page. There are several other pages you can visit, containing up-to-date info on the Red 'n' Whites. Also, visit and register on the Mackem Site Message Forum, and sign the Guestbook, which you can get into on the navigation menu. This site also consistantly gives information on the main news at Sunderland AFC. 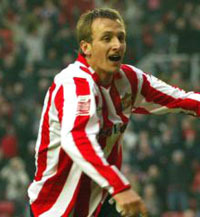 Who scored Sunderland's winner in the 2-1 victory at Sid James Park the first time round?